The Fellowship Hall of the Parish Life Center will serve our church family in a number of different ways. We will be able to accommodate 450 people at a sit-down dinner, with our fully-equipped kitchen supporting two lines for buffet service. At dinner-dances, parishioners will find the all-purpose flooring to be easy on their dancing feet. For fashion shows and theatrical skits, a portable stage can be set up at one end of the Hall, with 450 people sitting theater-style. In addition, the Hall is a full-size gymnasium with basketball goals and can be set up for volleyball, so we expect there will be many a spirited game played in the PLC. 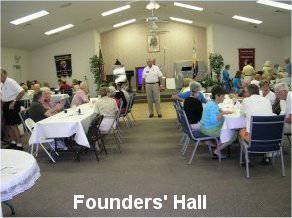 Founders Hall will also be available for parish events of 125 people or less. As with the Meeting Room wing, all of us that use the Fellowship Hall, whether as a Hall or sporting center, and Founders Hall need to follow some procedures and assume some responsibilities to assure that our facilities meet all our needs and remain in good condition. Parish events that are sponsored by the entire parish or one of its organizations (Women’s Club, Knights of Columbus, Senior Youth, etc.). These groups can reserve the Hall by completing the green Request Form available in the church office (237-3428). Requests must be made at least 30 days in advance and can be submitted up to 18 months in advance. Because we anticipate the Fellowship Hall especially will be in great demand, we advise that reservations be made as far in advance as possible. If an event is reoccurring on a regular basis, please note that on the Request Form. Ecumenical and charitable events sponsored by the Pastor. Private parties such as anniversaries, birthdays, wedding receptions. Insurance is required by the Diocese. Further information is available in the Insurance section.. The clean-up fee is included in the rental fee but may be reassessed based on the condition the Hall is left in following the event. Further information is available in the Clean Up section. A deposit of $250 for Fellowship Hall and the full amount of $150 for Founders Hall are required when the event is approved by the PLC Oversight Committee. At that time, the parishioner will also sign a Rental Agreement. Remaining fees are due 15 days in advance of the event. If an event has to be cancelled, please notify the church office as soon as possible. Other groups may be on a waiting list to use the facilities. 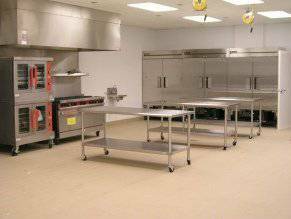 The Parish Life Center kitchen is fully furnished with sophisticated equipment that can be used only by those parishioners trained in its use. To receive training, contact the church office. At least one parishioner who has been trained must be present in the kitchen for all events described above. The Events Coordinator will be responsible for set-up and tear-down of the tables and chairs in the Fellowship Hall. Organizations and parishioners should coordinate their needs with this person by calling the church office. As in the past, committees and organizations are responsible for set-up and tear-down for events in Founders Hall. South Carolina law determines how alcoholic beverages are allowed and served in the Fellowship Hall and Founders Hall. Alcoholic beverages are permitted at parish sponsored events, such as dinner-dances, and at parishioner-sponsored private functions with the permission of the Oversight Committee. At no time will alcohol use be permitted or tolerated when the Fellowship Hall is used as a gymnasium for sporting events. Alcohol cannot be sold and must be provided by the person or group responsible for the event. All servers of alcoholic beverages must be 21 years of age or older. Servers may not personally partake of any alcoholic beverage while serving others. Alcohol will not be served to anyone under the age of 21, to anyone who appears to be intoxicated, or to anyone who is knowingly providing drinks to underage persons. Anyone dispensing drinks should serve only one drink at a time. We highly recommend that a professional bartender be used at all functions or parties where liquor is served, and the caterer’s liability must cover the bartender. We also highly recommend that an off-duty Sheriff’s deputy be hired for all major functions. Off-duty deputies are available through the Georgetown County Sheriff’s Office at a rate of $20 per hour. 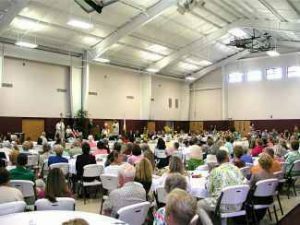 The organization, group or parishioner using either the Fellowship Hall or Founders Hall is responsible for cleaning either facility and must leave it in the same condition as it was before the event. A pre- and post-event checklist will be used. Failure to clean the facility properly will result in the loss of all or part of the deposit, if required. Any foods must be removed from the kitchen or the Halls at the end of the event. Any foods left will be disposed of the next day. Trash should be bagged and put in the dumpster located outside the kitchen. The Diocese of Charleston requires that an insurance policy be taken out for all non-church events such as parishioner-sponsored private parties and functions. The cost for this policy is $110 and is obtainable through the Diocese insurance company. A form is available through the church office. These must be completed, paid for and returned to the church office 30 days before the event.